Learn how to prepare a delicious homemade Murcian salad, very refreshing and very nutritious. It is a recipe with enough protein so it goes super well if you are eating healthy. If you prepare it for dinner, you will have a great time. You need peeled tomatoes, you can buy canned tomatoes or you can use fresh tomatoes, boil them for 60 seconds and remove their skin. You can use green olives or black olives, or both, as you prefer. If they are seedless, and without filling, better. 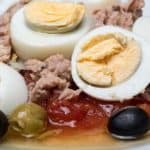 Ingredients and step by step preparation of a traditional Murcian salad. Very refreshing and very nourishing.Put them to boil for 10 minutes in a pot with water that is completely covered. Once ready, let them sit for a few minutes in fresh water and then peel them. Pica the tomatoes in small cubes or in strips, whichever you prefer. The onion cut it in thin or julienne strips. Drain the oil from the tuna tins. Cut the eggs in quarters, that is, in the middle and then each half, by half. Likewise if you prefer you can put it in smaller pieces but you can undo the yellow part. Now you are going to gather everything in a salad bowl or in your favorite bowl to Serve salads. First put the tomato and onion mixed in the bottom, as if it were a bed. Then you can put the tuna previously drained in the middle. Put the olives and eggs on the sides. Add salt to taste and a good olive oil stream. Likewise, if you prefer you can simply mix everything without so much decoration and that's it. 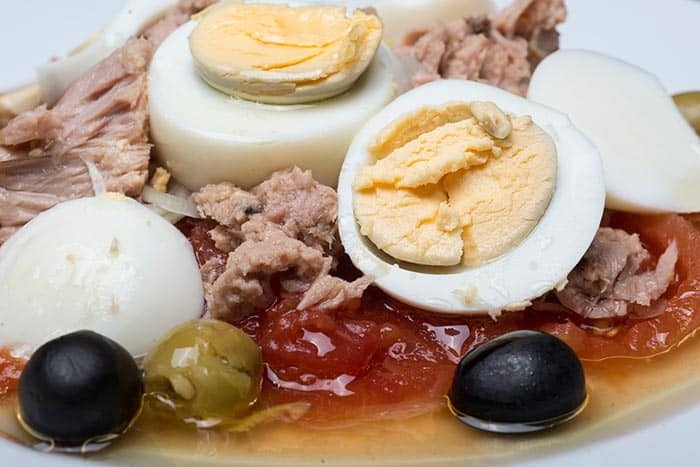 Ready, you have a refreshing and delicious Murcian salad. You can make a small modification to this recipe simply by replacing the tuna with about 100 grams of desalted and crumbled cod. You cook it a couple of minutes in water and that's it. Another modification to the original recipe to add an extra carbohydrate. Boil a medium potato, with its skin. Once it is cooked, let it cool and cut it into medium cubes. Simply pour it into the ready-made salad. Ready. With what to accompany the salad from Murcia? You can accompany it with homemade bread if you want to eat it alone or if you are going to use it as a garnish, it is perfect for a dish legumes or some rice. If you like a lot of salads, visit our page with salad recipes.